The La Liga title looks dead and buried after top-placed Barcelona cruised past second-placed Atletico Madrid. The Catalans now carry an 11-point lead at the top of the summit with seven fixtures to go. Real Madrid and Zinedine Zidane are now two points behind neighbours Atletico after spending most of the campaign fighting for top four. Elsewhere, Celta Vigo kicked away from the relegation zone after enjoying a three-match unbeaten run. Will Real Madrid leapfrog Atletico? Will Villarreal get relegated? Mid-table neighbours Espanyol and Alaves are set to lock horns in one of five La Liga ties on the day and kick off round 32 at RCDE Stadium. These teams are separated by seven points, with the visitors fighting for top four while Espanyol are looking to make it to the Europa League. Alaves are winless in their last three league encounters allowing fourth-placed Getafe to move five points clear with seven games to go. Espanyol’s 2-1 win at Girona last Sunday brought them back in contention for a spot in Europe next season, though they will have to win such games at all costs. With everything to fight for, back Espanyol to claim maximum points at 15/20. Barcelona stole the win against Atletico Madrid last Saturday thanks to two late goals from Luis Suarez and Lionel Messi at the Camp Nou. 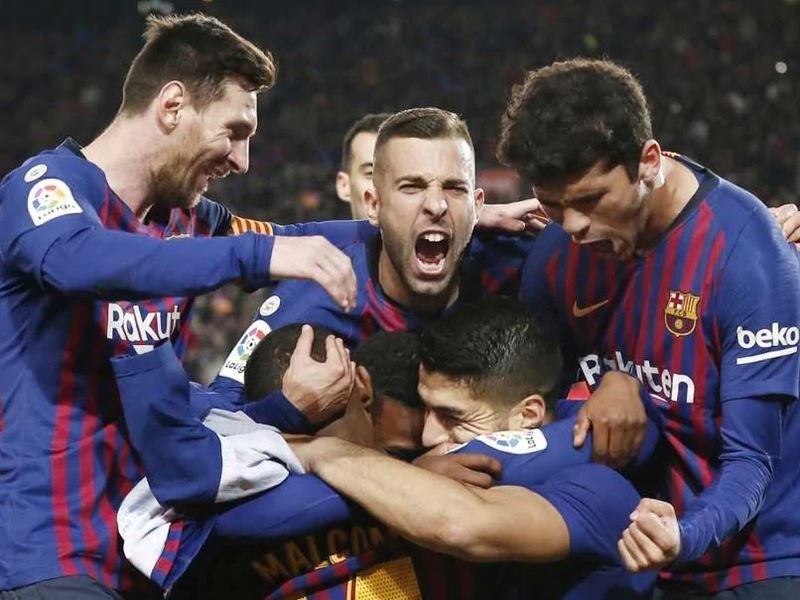 It was a massive victory which almost confirms La Liga as Barca moved 11 points clear with seven games to go. On the other hand, this could be confirmation of Huesca’s relegation. The newcomers needed the experience of top flight football and they will comeback much stronger next time. For now, Barcelona will want to wrap up the league as soon as possible so they can focus on the Champions League. Back the visitors at a valuable 6/10. With seven more rounds to go, Atletico Madrid enjoys a two-point lead at the second spot in the table and has an 11-point buffer as far as challenging for the league is concerned. Diego Simeone’s men were kicked out of the Champions League last month after enjoying 2-0 lead at home. This is yet another trophyless season for Atletico, though Simeone can still be proud of how his team played throughout the season. At 4/10, back Atletico Madrid to end Celta Vigo’s three-match unbeaten run. This derby between Sevilla and Real Betis does have the potential to be one of the most exciting ones. Both teams are playing good football and are fighting for a place in Europe next season. Surprisingly, Real Betis have dominated this match in recent fixtures and they come into this game unbeaten in the last three encounters against the hosts. Sevilla have improved under the new coach, winning four of the five matches played under the new mentorship. Back Sevilla to beat their neighbours at 15/20. Getafe have struggled to impress in the second part of March after enduring a three-match winless run but we’ve seen them bounce back to the winning ways last week and kept their fourth position on the table. Travelling to relegation-threatened Valladolid in the hope of making back-to-back wins will mean the visitors have to work overtime to achieve that. To be fair, a team challenging for a Champions League spot should be competing in all the grounds especially against bottom-of-the-table teams. Get on the visitors at 16/10. Athletic Bilbao will be expected to beat Vallecano when the two teams meet on Sunday and it will be another opportunity for the home side to move into the Europa League qualification zone. The hosts have only lost two games in the last three months as they return to the San Mames, where they have won seven and lost just twice all season. Such a result would have been unthinkable a few months ago as the team was struggling in the relegation battle but things changed when Gaizka Garitano took over. Get on Athletic Bilbao to win comfortably at 7/10 and include in all bets. Real Sociedad and Eibar are going to face each other in the 32nd round of La Liga on Sunday afternoon. Both teams are positioned in the middle of the table and they have been in a very poor streak lately. The hosts have won once from their last seven league matches, while Eibar have tasted victory twice in their last nine La Liga encounters. This match has all the ingredients of a draw and I suggest backing these sides to cancel each other out at 47/20. Both Girona and Villarreal are struggling to find the right form coming into weekend’s tie which has all the ingredients of a relegation six-pointer. Both teams began the season in a promising fashion, but they both experienced a huge slide in form in recent weeks. It wrapped them up into the relegation scrap. Girona are four points above their opponents who occupy the 18th spot in the red zone. Get on Both Teams to score at 7/10. Valencia have been very consistent since the start of the year and are challenging for a top six place which nobody could have predicted this season as they have come back up from battling most of the first half in bottom half. Marcelino Garcia saw his team’s 14-match unbeaten run come to an end when losing 2-0 against relegation-threatened Vallecano. On the flip side, the visitors are winless in their last nine encounters and winning once from their last 14. Get on Valencia to win comfortably at 5/10. Real Madrid returned to winning ways after suffering their first defeat since Zinedine Zidane’s return last Wednesday when they fell 2-1 to in-form Valencia away at Estadio de Mestalla. Though it wasn’t the greatest of performances from the European champions, the win moved them two points behind second-placed Atletico Madrid. Knowing Zidane, he will push for that second position on the log so that means this is a must-win encounter for Real Madrid. Get on Zidane’s men at 11/20.